This guide provides help with diagnosing issues encountered during a Pivotal Cloud Foundry (PCF) installation. Besides whether products install successfully or not, an important area to consider when diagnosing issues is communication between VMs deployed by Pivotal Cloud Foundry. Depending on what products you install, communication takes the form of messaging, routing, or both. If they go wrong, an installation can fail. For example, in an Pivotal Application Service (PAS) installation the PCF VM tries to push a test application to the cloud during post-installation testing. The installation fails if the resulting traffic cannot be routed to the HA Proxy load balancer. The debug endpoint is a web page that provides information useful for diagnostics. If you have superuser privileges and can view the Ops Manager Installation Dashboard, you can access the debug endpoint. Files allows you to view the YAML files that Ops Manager uses to configure products that you install. The most important YAML file, installation.yml, provides networking settings and describes microbosh. In this case, microbosh is the VM whose BOSH Director component is used by Ops Manager to perform installations and updates of PAS and other products. Components describes the components in detail. Rails log shows errors thrown by the VM where the Ops Manager web application (a Rails application) is running, as recorded in the production.log file. See the next section to learn how to explore other logs. This section contains general tips for locating where a particular problem is called out in the log files. Refer to the later sections for tips regarding specific logs (such as those for PAS Components). To troubleshoot specific PAS components by viewing their log files, browse to the Ops Manager interface and follow the procedure below. In Ops Manager, browse to the PAS Status tab. In the Job column, locate the component of interest. In the Logs column for the component, click the download icon. 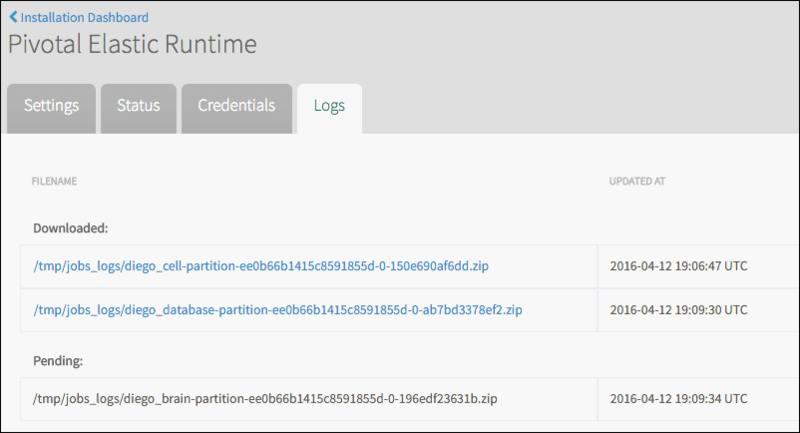 Browse to the PAS Logs tab. Once the zip file corresponding to the component of interest moves to the Downloaded list, click the linked file path to download the zip file. Once the download completes, unzip the file. The contents of the log directory vary depending on which component you view. For example, the Diego cell log directory contains sub-directories for the metron_agent rep, monit, and garden processes. To view the standard error stream for garden, download the Diego cell logs and open diego.0.job > garden > garden.stderr.log. The IP address of the PCF VM shown in the Settings tab of the Ops Manager Director tile. Your import credentials. Import credentials are the username and password used to import the PCF .ova or .ovf file into your virtualization system. Run ssh IMPORT-USERNAME@PCF-VM-IP-ADDRESS to connect to the PCF installation VM. Enter your import password when prompted. You are now in a position to explore whether things are as they should be within the web application. You can also verify that the microbosh component is successfully installed. A successful MicroBOSH installation is required to install PAS and any products like databases and messaging services. If you are unable to resolve an issue by viewing configurations, exploring logs, or reviewing common problems, you can troubleshoot further by running BOSH diagnostic commands with the BOSH Command Line Interface (CLI). Note: Do not manually modify the deployment manifest. Operations Manager will overwrite manual changes to this manifest. In addition, manually changing the manifest may cause future deployments to fail. To view the VMs in your PCF deployment, perform the following steps specific to your IaaS. Select the following: job, deployment, director, index. Select the top level object that contains your PCF deployment. For example, select Cluster, Datastore or Resource Pool. In the top tab, click Related Objects. Right click on the Table heading and select Show/Hide Columns. Select the following boxes: job, deployment, director, index. The Apps Manager provides a graphical user interface to help manage organizations, users, applications, and spaces. Run cf login -a api.MY-SYSTEM-DOMAIN -u admin from a command line to log in to PCF using the UAA Administrator credentials. In Pivotal Ops Manager, refer to PAS Credentials for these credentials. Run cf target -o system -s apps-manager to target the system org and the apps-manager space. Run cf logs apps-manager to tail the Apps Manager logs. The Apps Manager recognizes the LOG_LEVEL environment variable. The LOG_LEVEL environment variable allows you to filter the messages reported in the Apps Manager log files by severity level. The Apps Manager defines severity levels using the Ruby standard library Logger class. By default, the Apps Manager LOG_LEVEL is set to info. The logs show more verbose messaging when you set the LOG_LEVEL to debug. To change the Apps Manager LOG_LEVEL, run cf set-env apps-manager LOG_LEVEL with the desired severity level. Once set, the Apps Manager log files only include messages at the set severity level and above. For example, if you set LOG_LEVEL to fatal, the log includes fatal and unknown level messages only. To obtain disk usage statistics by Diego Cell VMs and containers, see Examining GrootFS Disk Usage.